Portola High School is known for creating an environment where students can learn, contribute and thrive. Varsity Driving Academy has a similar approach to learning. Our goal is to let student contribute by making their own schedule and learn how to drive safely and form safe driving habits. We also want all of our students to thrive not only with us but also on their path to greatness. Find out more about how our students thrive below and then sign up for classes today! 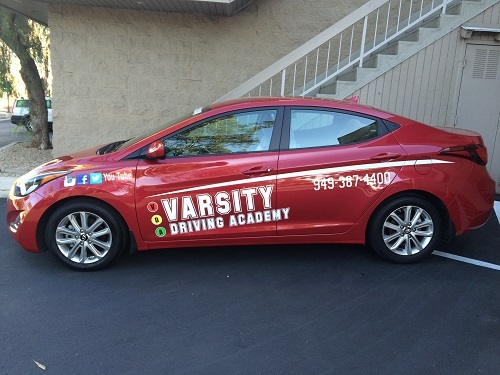 Welcome to Varsity Driving Academy Portola High School Driving School! Portola High School driver’s ed students can take full advantage of our free pick-up and drop-off service for every behind the wheel training session. Students of Varsity Driving Academy can contribute to their learning experience by managing their own time. Online learning gives students the ability to learn when they want and stop at any time. This amount of freedom means learning how to drive can be done only when you have the time and you don’t need to adjust your schedule for a class. It’s easy to get started with online learning. First, register for classes and create a username and password. When you’re ready, you can log in, learn some basic driving skills and log out. Any progress is saved so when you come back, you don’t need to start all over again. It’s that easy. After a student gets their learner’s permit they can move onto the next stage, behind the wheel training. This stage is important to learning how to drive for many reasons. The most important reason is that your learner’s permit is not valid until one of our trained professionals signs off on the permit. We have a different approach to behind the wheel training, one on one sessions. There was a time when behind the wheel training was done with a car filled with students. We feel a car full of students creates a stressful environment for the student behind the wheel. This is why we have one on one sessions. We want our students to feel safe asking questions, making mistakes, and learning how to drive safely not trying to impress other students in the car. The DMV is another aspect of learning how to drive that creates stress and can be a hard environment to get through. Luckily, our students can take full advantage of our DMV package. Our DMV package allows us to schedule appointments, gather paperwork, and keep our students out of the DMV as much as possible. Our goal is to take away as many stresses from the from learning how to drive as possible. Please contact us for more information regarding our services at (949) 387-4400. Our vehicles are hand picked to ensure students safety while training. We get the vehicles inspected regularly and keep them maintained. One on one Behind-the-wheel training. Work at your own pace with our DMV Approved Online Class. We provide free pick up and drop off. We provide a DMV package which provides you use of our car to take your behind-the-wheel test. Varsity Driving Academy and logo are Trademark of Varsity Driving Academy. © 2018 Varsity Driving Academy.